Driving while stoned isn't a good idea, and it's a crime in all 50 states, some of which have set blood-test limits for marijuana. But unlike blood alcohol content, THC blood levels don't have much to do with impairment. Cannabis metabolites remain in fat cells after you stop smoking and can be detected for as long as three months in frequent pot smokers -- including many medical marijuana patients, who regularly have elevated THC blood levels. People taking advantage of the state-legal marijuana sales that begin Jan. 1 in Colorado should be aware of another new law there -- a measure passed last spring that creates a "permissive inference" of intoxication when a driver tests above five nanograms of THC per milliliter of blood. 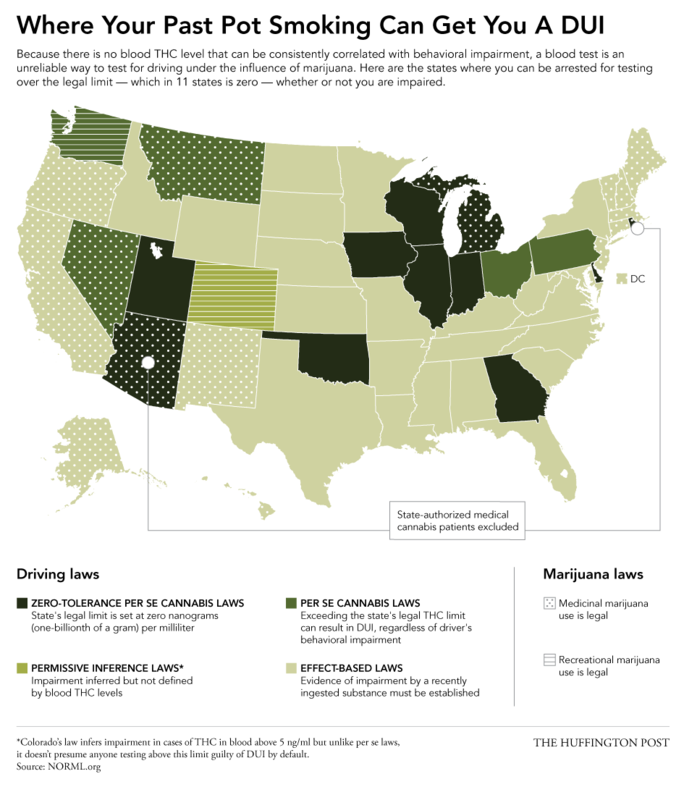 Among states' legal limits for marijuana in the bloodstream while driving, Colorado's is relatively lenient. More than a dozen states have "per se" cannabis driving laws that hand a DUI conviction, without a trial, to anyone exceeding the state's THC blood limit. Most of those limits are set at zero. Most states have effect-based laws that require evidence of impairment due to recent ingestion of a controlled substance for a DUI conviction. Get the specifics on your state's drugged driving laws here. There is no evidence that per se laws reduce traffic fatalities, according to a recent study by D. Mark Anderson of Montana State University and Daniel Rees of the University of Colorado. They may also "inadvertently become a criminal mechanism for law enforcement and prosecutors to punish those who have engaged in legally protected behavior and who have not posed any actionable traffic safety threat," Paul Armentano of the National Organization for the Reform of Marijuana Laws said in a peer-reviewed report examining the limitations of per se cannabis driving laws. In Washington state, where recreational marijuana use is legal and a per se driving law has been passed, a growing number of drivers are testing positive for marijuana. According to the Associated Press, a State Patrol spokesman said the increase might be because "we're testing blood we didn't test before." The White House has recommended that all states pass zero-tolerance per se drugged driving laws.